MONTREAL, QUEBEC, CANADA, November 27, 2018 /EINPresswire.com/ — GoGo Quinoa, the market leader in quinoa in North America, is proud to present its first Canadian quinoa. Now with grains from the Canadian prairies, this quinoa is certified gluten-free, with no traces of peanuts or other allergens. 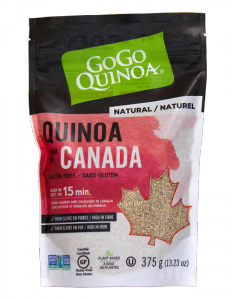 GoGo Quinoa is proud to encourage the local economy by supporting Canadian farmers and their communities through the commercial development of this grain, one that is filled with superior nutritional values, contributing to the well-being of Canadians. As of now, this new product is available in health food stores, independent stores and will soon be found in supermarkets. Active since 2004, GoGo Quinoa (Cie 2 Ameriks) imports and processes more than 60 vegan and non-allergenic products made from quinoa and other super grains and legumes (chia, amaranth, buckwheat, lentils, chickpeas). The launch of Canadian quinoa coincides with the ongoing expansion of the company situated in Laval, meeting the growing demand for its product line in Canada and internationally. Today, the company occupies a 45,000 square foot plant certified SQF, organic, gluten-free and kosher. For more information please visit our website at https://www.gogoquinoa.com/en/ or reach the marketing team at info@gogoquinoa.com.